Key difference: Snowboarding is the practice of riding a snowboard down the snow hills or snow covered slopes. Wakeboarding means to ride the surface of a water body using a wakeboard. Snowboarding can be understood as a sport where the participant, referred to as the snowboarder, gets on to a snowboard and rides down the slope of a snow hill or some other snow-capped slope. Snowboarding originated in the United States in the 1960’s. Snowboarding is actually inspired from another popular board sport, which is surfing. The riding principle of snowboarding is borrowed from surfing as well. Athletes of both, snowboarding and surfing ride their boards by shifting their weight from back to front and vice versa. Besides, the body postures assumed by participants while performing these sports are also the same. Snowboarding can be performed with or without safety bindings as well. To snowboard with bindings, the snowboarder has to align his feet in line with a pair of non-release plate bindings on the board, and attach it either to his heels, toes, or both toes and heels at once. Bindings are advisable for beginners, as they provide security from falling and ensure utmost stability. Wakeboarding is a sport where the participant, who’s known as a wakeboarder, rides the surface of a water body, by using his/her wakeboard. One important thing about wakeboarding is that the athlete participating in this sport, would always need some sort of a propeller. Reason being that the wakeboarder has to generate speed and movement, through which he can ride the water and perform various tricks associated with it. For this purpose, cable systems, or winches are used to attach the wakeboarder to vehicles such as a motorboat, a jet ski, a personal water craft, etc. for wakeboarding. Like snowboarding, wakeboarding is also a spin-off from surfing. 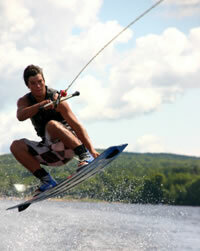 In fact, wakeboarding was known as skurfing, when it began in the latter stages of the 1980’s. Wakeboarding is akin to surfing, but not the same as it. This is because in surfing, the surfer propels himself and his surfboard by riding a wave, or by paddling through water, but in wakeboarding, the participant has to be towed by a vehicle. Moreover, surfing is possible only in those water bodies that generate waves. Surfing cannot be done in still water. However, wakeboarding requires no such specifications, and can be executed on any water body, provided there is a propeller available. 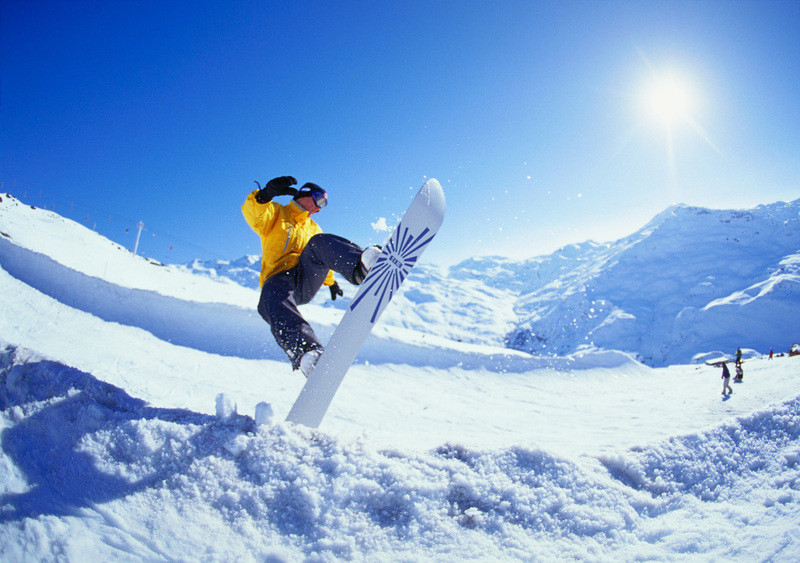 Snowboarding is the practice of riding a snowboard down the snow hills or snow covered slopes. Wakeboarding means to ride the surface of a water body using a wakeboard. Generally a vehicle like a motorboat, or a jet ski, etc. Bindings are a common in snowboarding. Wakeboarding usually isn’t performed with bindings. Snowboarding is done on snow. Wakeboarding is done on the surface of water.